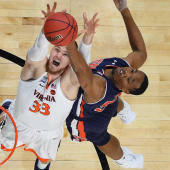 The NCAA Tournament field shrunk from 32 to 24 on Saturday as eight teams punched their respective tickets to the Sweet 16 on Saturday, and eight head into their offseasons. What started as a promising day with close games ended with one blowout after another. Michigan. Florida State. Michigan State. Purdue. Auburn. All five cruised to easy wins, leaving little to no chance for the madness of March to make things interesting late. One of the most talented players in the field was also eliminated Saturday. Murray State star Ja Morant, who dazzled with the NCAA Tournament's first triple-double since 2012 in his first showing on Thursday, went down swinging in a 90-62 loss to No. 4 seed Florida State. Meanwhile, LSU, Kentucky and Gonzaga all won in different variations. LSU earned a near buzzer-beating win in what was the best finish not only of the day, but of the tournament so far. Kentucky won a thriller, limiting sharpshooting Wofford to 56 points and flexing its defensive capabilities. And Gonzaga won with an all-around showing, scoring 83 in a cruising victory. CBS Sports was with you the entire way Saturday updating this story with the latest scores, highlights and updates from the second round. If you are unable to view the live updates below, please click here.